Hachimantai Geothermal Development | Our Business | Mitsubishi Gas Chemical Company, Inc. The Sumikawa Geothermal Power Plant, located in Hachimantai in Akita prefecture, actively seeks to make effective use of clean, natural energy. In 1981, the Mitsubishi Metal Corporation (now Mitsubishi Materials Corporation) began to conduct geothermal exploration in cooperation with our company, with an eye toward establishing a geothermal Power plant in the Sumikawa region of Akita prefecture. The Sumikawa region is located on the north side of the Hachimantai and Yakeyama volcanic ranges that run from east to west; the underground temperature of the bedrock at the depth of about 1000m is over 200°C. When groundwater heated by this high-temperature bedrock is brought to the surface, the sudden drop in pressure causes it to boil, separating it into steam and hot water. 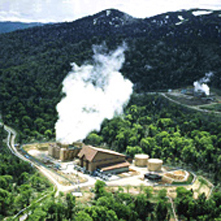 Geothermal power generation is the utilization of this steam to generate electricity. In 1990, a concurrent production test was performed on the drilled steam production well to confirm that there existed steam production capacity sufficient to drive a power station with a planned output of 50MW. In addition, an environmental impact survey was performed. As a result of these tests, a construction plan was formed for a geothermal power plant, the construction of which was implemented in 1993 in cooperation with Tohoku-Electric Power Co., Inc. The Sumikawa Geothermal Energy Plant has continued to be operated stably since it commenced operation in 1995. In recent years, environmental problems such as global warming are being examined closely. Geothermal power is one form of clean, earth-friendly energy, and is invaluable as a domestically produced renewable energy source.